into the file name and click insert. Type in the personal information you want to be in your signature. Pull down the "Choose default signature - New Messages: and Replies/Forwards:" buttons and select your newly created signature as the one you want to use. Here in my example I named the new signature "Demo." 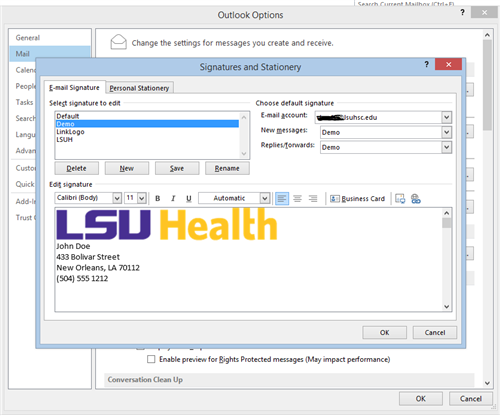 Click OK to close the Signatures and Stationary dialog and click OK to close the Outlook Options dialog. The creation of your new signature is completed.